We have reintroduced these by popular demand. They will be available for only a short time - until the end of summer 2006 or before, if stock runs out. 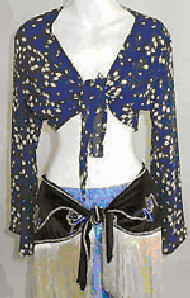 Print chiffon tie-front top with bell sleeve. Each one a unique fabric print. Fits no larger than a medium upper arm circumference and up to a DDD cup. The sash is stretch velvet with chainette fringe and sequin bead motifs. Will fit up to about size 16 hip. Please indicate first, second, and third color choice when ordering as supplies are very limited ... even better, contact us the day you plan to order and we will tell you what is in stock that day.